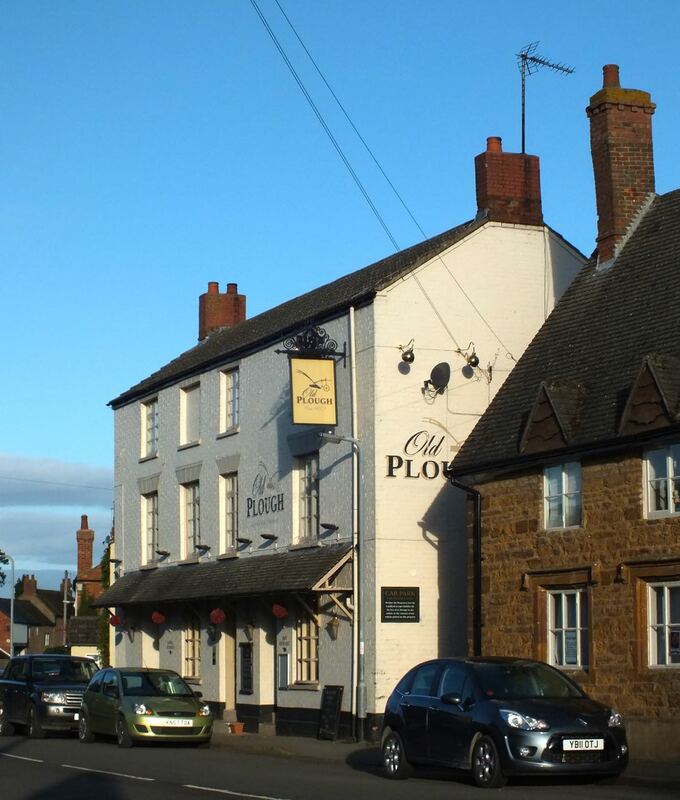 Boaters, if you have moored up for the night in Braunston, had a pint at the Admiral Nelson and a hearty breakfast at Gongoozlers Rest, I suggest a stroll up the hill from the canal to the village to complete your revictualling. But boaters beware* you need to time your visit very carefully or you’ll come away mighty disappointed. Walk over the bridge and up the path from Braunston Marina, itself a joy, into Nibbets Lane and in no time at all you’ll reach the High Street. Turn left and just in front of you you’ll seeThe Old Plough. Richard assures me the beer is good at The Old Plough. They do serve food there too, although we didn’t eat there this time. Continuing along you’ll come to Southfield Cottage which if you need a bed for a night (or more – you won’t want to leave) is a haven. I can’t recommend it highly enough. 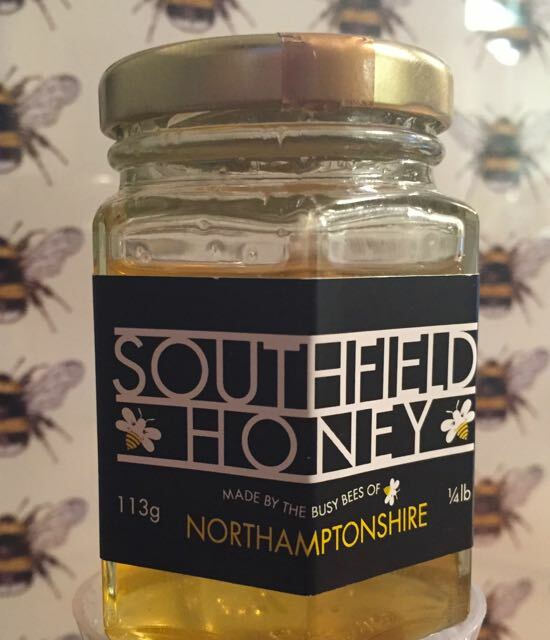 It’s Braunston’s gem – and it’s the home of Southfield honey. There are some other gems and delights in Braunston too. Turn right at the top of Nibbetts Lane and you’ll find Braunston Community Café run by volunteers. The food is well priced, good and fresh, and you’ll be welcomed by a friendly faces. We had pots of tea and sandwiches and walked away feeling very happy. Our next stop was for some serious supplies. You’ll get all the basics at the convenience store including a good range of fruit and vegetables, wine, local eggs and bacon. No matter how well stocked the convenience store I do recommend popping into the butcher over the road where you’ll find good quality meat, sausages, pies, chutneys, preserves, vegetables and eggs. But no revictualling expedition would be complete without a trip to one of Braunston’s institutions, The Braunston Fryer. Here your impression that Braunston is a friendly village will be cemented. 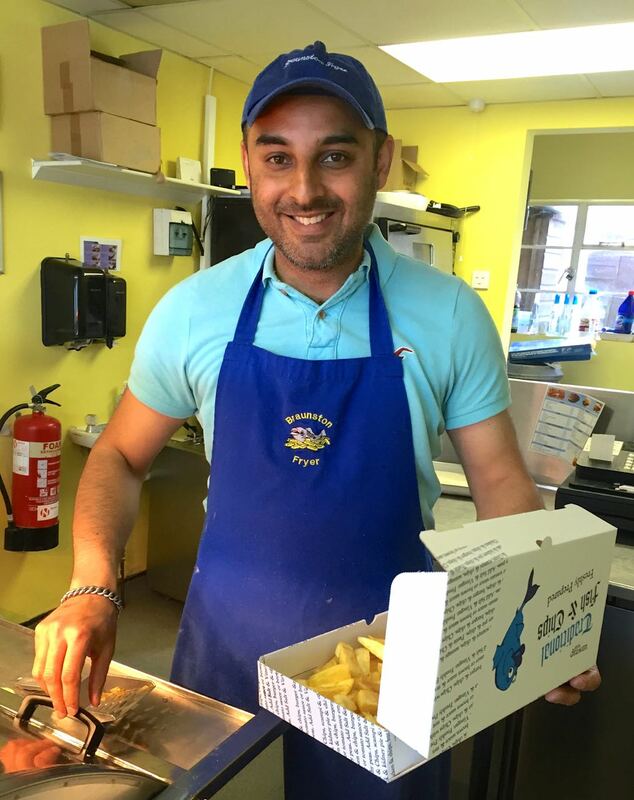 You’ll be greeted by Gurvinder ‘Bob’ Gill who recently took over the Fryer. Everything is cooked to order so if you’re in a hurry you need to phone in advance to order. If not you can happily while away the time chatting to Bob while he carefully cooks your food. He’ll no doubt tell you that he refuses to pre cook anything other than a sausage or two and that people come from Rugby to Braunston for the fish and chips, notwithstanding that Rugby has about five of its own F&C shops. That’s something to think about. In all the years we’ve been in Braunston I’ve never bought fish and chips from The Braunston Fryer. I’m not sure why not. But there is no question that the first thing I’ll do when we’re back in Braunston will be to run up the path to get some fish and chips for supper. The real question is how will I fit in all the trips up to the village and along the canal to savour the delights of Braunston. 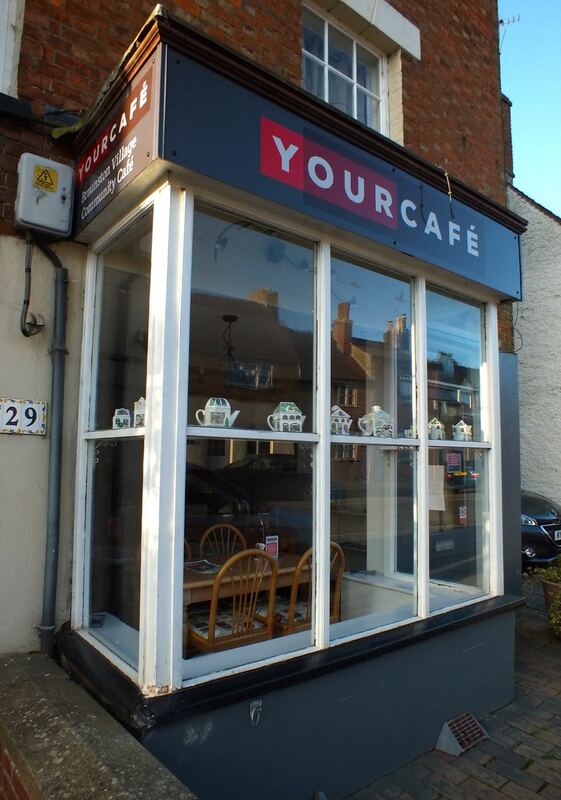 * Braunston Community Café and The Braunston Fryer have limited hours and days. Neither one is open on Sunday or Monday and the community café isn’t open on Tuesdays either. The convenience store however has long hours everyday – open from 6am. Mmm, didn’t realise how delicious it was.